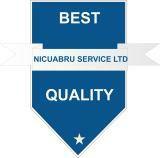 Since 2009 NICUABRU SERVICES LTD has been a key link in the provision of full life-cycle service for buildings in both public and private sectors including reactive and planned buildings maintenance, grounds maintenance and a host of other services. Areas of expertise includes the followings: plumbing, re-wiring or new electric installations, plastering, painting and decorating, tiling, kitchen fixing, bathroom designs, roofing. At present is one of few able to offer complete solutions for the delivery of a wide range of innovative schemes. Typical works include kitchens and bathrooms renovations and new build, new central heating, wall insulation, rewiring, new roofs, cladding, timber care repairs doors and windows, as well as general repairs. Customer satisfaction is very important, and this is achieved through active staff training and understanding of individual roles of all parties in delivering a successful project; both physically and to meet both the clients expectation of quality whilst ensuring the residents satisfaction is maintained.